Now with 250K copies in print! Revised and Updated Edition. Anne affirms that Heaven truly is the home of your dreams: a home of lasting value that's fully paid for and filled with family, where you will be wanted and welcomed. Best of all, Heaven is a home you are invited to claim as your own. With over 40 percent new and revised content, Anne Graham Lotz has updated her classic book on Heaven for a whole new generation of readers, and also for herself. With her father, mother, and husband now gone, Lotz beautifully adds her own vulnerability and stories to the journey contained in Heaven: My Father's House. Jesus promised us, "In My Father's house are many rooms...I am going there to prepare a place for you." Amid the turbulence of today's world, we cling to the hope of a heavenly home where we will be welcomed into eternal peace and safety. Anne affirms that Heaven truly is the home of your dreams: a home of lasting value that's fully paid for and filled with family, where you will be wanted and welcomed. Best of all, Heaven is a home you are invited to claim as your own. Heaven: My Father's House by Anne Graham Lotz was published by Thomas Nelson in July 2018 and is our 11499th best seller. 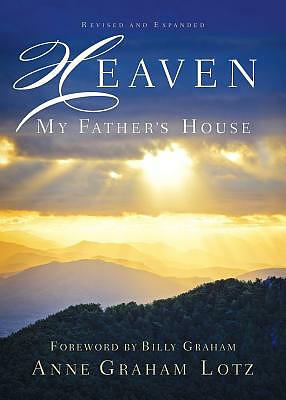 The ISBN for Heaven: My Father's House is 9780785227427. Be the first to review Heaven: My Father's House! Got a question? No problem! Just click here to ask us about Heaven: My Father's House.